In his many decades of ministry as a bishop and, before that, in leading Saint Meinrad Seminary and School of Theology in St. Meinrad, Archbishop Emeritus Daniel M. Buechlein shaped the lives of many clergy, religious and lay faithful far beyond the confines of the Church in central and southern Indiana. Indeed, his influence reaches nearly to the ends of the Earth—including to Alaska. Archbishop Paul D. Etienne of Anchorage, Alaska, served as an archdiocesan priest under Archbishop Buechlein until he became the bishop of Cheyenne, Wyo., in 2009. Archbishop Etienne preached a homily, at times tinged with emotion, during a Solemn Evening Prayer liturgy on Jan. 30 at SS. Peter and Paul Cathedral in Indianapolis that was part of the funeral rites for Archbishop Buechlein. “During my years as a priest here in this archdiocese, [Archbishop] Daniel was the only archbishop I served,” Archbishop Etienne said. “We did not have an archbishop when I was ordained [on June 27, 1992], and once Daniel was installed a few months later, there was a sense of wholeness that ensued, which was a great lesson regarding the relationship between a priest and his bishop. The time of the death of Archbishop Buechlein was especially challenging for Archbishop Etienne because his mother, Carolyn Etienne, died on Jan. 28, three days after the archbishop’s death. Archbishop Etienne reflected on how the life and ministry of priests and bishops are an expression of love for Christ that often challenges them to do things they don’t think they are capable of doing. He recalled how Archbishop Buechlein asked him many times to take on such challenging responsibilities. But he made those requests, Archbishop Etienne said, because that had been the case in his own life. “With each new assignment in Daniel’s life, his ‘Yes’ was renewed as he took on greater responsibility,” Archbishop Etienne said. “He renewed his trust in God and opened himself to a realm of greater possibilities, tapping resources he did not yet know he possessed. For him, and each of us, this is how we discover the great things God can do in and through us who make a gift of self to God and to others. Archbishop Etienne also reflected on Archbishop Buechlein’s dedication to take the word of God to the faithful in his role as a teacher. 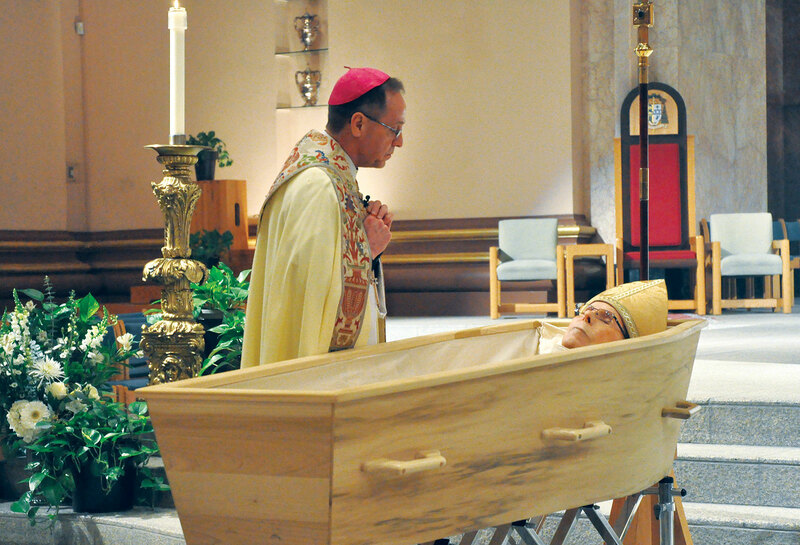 “A life of service to God’s word, now allows the heavenly Father to see the living Word within Daniel,” Archbishop Etienne said, “and this is what pleases the Father most, seeing his Son Jesus in each of us. Father Rick Nagel and many young adult Catholics across the archdiocese know these blessings well. The priest and some of these young adults attended the Evening Prayer liturgy in gratitude for Archbishop Buechlein starting the archdiocesan Office of Young Adult and College Campus Ministry in 2009. Hagenauer, now a member of St. Joan of Arc Parish in Indianapolis, was confirmed by Archbishop Buechlein in 2002 when she was a student at Father Thomas Scecina Memorial High School in Indianapolis. In 2009, Archbishop Buechlein appointed Father Nagel the director of the newly created Office of Young Adult and College Campus Ministry. At the time, he said there were two college campuses in the archdiocese that had an “intentional Catholic presence” among the 15 colleges in central and southern Indiana. Today, there are active campus ministry programs for Catholics at 12 of those colleges. Father Nagel hopes that Archbishop Buechlein will continue to help the ministry of the Church in central and southern Indiana to young adults continue to flourish.